Before Bridge Over Troubled Waters, Bookends released in 1968 was the most accomplished Simon & Garfunkel album out there. It moved away from traditional folk music but still retained the ideals of that generation, had an overarching theme of growing up if not older and a very upbeat, finger-clicking rhythm. The moving America, a meditation on country, was later covered by Yes as an epic progressive rock song stretching a few minutes into tens of minutes. The songs that featured the best tunes were Save The Life Of My Child and A Hazy Shade Of Winter. Both were signposts that Simon was embracing the new. Bookends was his literary device to place all he wanted to say about his society on two sides of vinyl. Both the rapid changes of the urban new and the letting go of a slower pace of life. When this boot first appeared it was the first time studio outtakes of Simon & Garfunkel tracks had arrived in such quality. 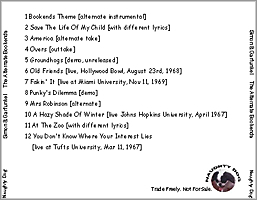 The fan collective, Purple Chick, went to great lengths to offer not only the alternate album, but a compilation of live tracks of all the songs on Bookends and included as a bonus the original Bookends album in mono. The mono LP was not a typical fold-down from stereo but a unique mix that is out-of-print. We are offering only one-third of the Purple Chick bootleg - the alternate album but even then had to remove the 7-inch mixes of Fakin It, A Hazy Shade Of Winter, the b-side You Dont Know Where Your Interest Lies and the demo Old Friends as these are official releases. The latter you can get when you buy the remastered Bookends. 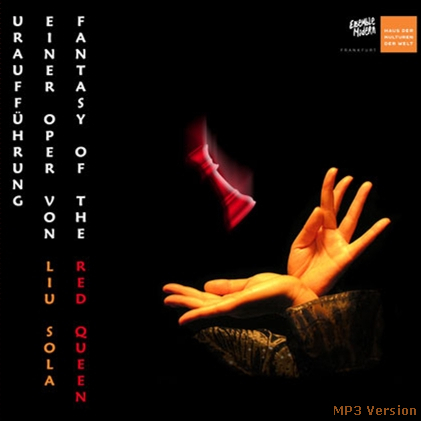 They have been substituted with unreleased live versions. Theres still plenty to marvel at, the unreleased Groundhogs and the alternate lyrics in the song At The Zoo. The sequence of tracks follows Purple Chicks set. And wed also like to ask why every time a fresh greatest hits S&G set is assembled the bonus live tracks are inevitably taken from the released Live In New York City 1967 disc? 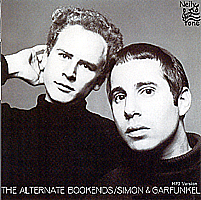 Click on the link to order the reissued CD version of Simon And Garfunkel s Bookends.